Garage door openers add extended functionality to garage doors by automating them, essentially making your home a more convenient and secure place. There are many advantages to having them, and it is because of their popularity that our team specializes in providing customers with installations, repairs, maintenance, and replacements for garage door openers and their related components. If you are looking to have a new motor fitted, or simply need to have your current one restored, call us now to find out a little bit more about our opener services, and how they can benefit you. Our team specializes in replacing and installing door openers of all types. We work with manufacturers such as Genie, Chamberlain, and Liftmaster to ensure that we source only the highest quality motors, whether they be drive, screw, or chain-drive. Once we’ve selected the best part for your home, we get to work installing or replacing the opener with the utmost care and accuracy. Should your openers face any faults or failures, our team has the necessary experience and skill required to restore them to their former operational capabilities. A faulty opener can make it next to impossible to use your doors, and may even render them unsafe. 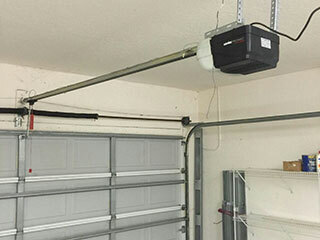 Contact our technicians today if you need to have your garage door opener repaired by a trusted professional. In order to ensure that your door motor enjoys a long and productive lifespan, it is necessary to perform routine maintenance and inspections. This way you will be able to deal with problems before they become too serious, while also reducing the friction under which the opener works. Doing so will also push back the need for expensive replacements or repairs. If you would like to find out more about our various garage door opener services, and how they can benefit you, contact one of our technicians at Garage Door Repair Highland today.